Having won a Queen’s Award for Enterprise 2012 in the International Trade category, digital signage firm ONELAN received a visit from the Queen's representative The Lord-Lieutenant of Oxfordshire, Tim Stevenson, accompanied by one of his cadets, Harry Griffiths. 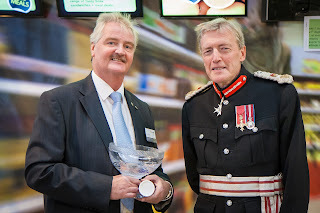 Following a tour of the premises and a short presentation from David Dalzell, ONELAN’s Founder and Managing Director, the Lord-Lieutenant enjoyed a buffet lunch provided by local company Absolute Delights. This was attended by ONELAN staff, and other dignitaries including the Chairman of Oxfordshire County Council, Don Seale, the Chairman of Oxfordshire Local Enterprise Partnership, Adrian Shooter and the Chairman of South Oxfordshire District Council Councillor, Janet Carr. The award takes pride of place in the company’s already considerable array of awards including a Queen’s Award for Enterprise in the Innovation category awarded in 2010. The company wins the International Trade award for outstanding achievement in overseas sales growth with an increase in exports over the last three years of 295%. Export sales now represent 44% of the company’s sales turnover. ONELAN’s export strategy is in part a result of the need to counterbalance the potential impact of the recession on the domestic and European markets of external influences. September 2012….At Infocomm Middle East and Africa (MEA) at the Dubai International Convention & Exhibition Centre, UAE 14th – 18th October 2012 ONELAN will be exhibiting with their partner, Dutcotennant, and will be showing Digital Signage and the latest software updates. HD capture will also be demonstrated. Exhibitors will be showing solutions for numerous applications including videoconferencing, e-classroom, smart buildings, digital signage and digital out-of-home (DOOH) media advertising, broadcast and entertainment production and delivery, and digital network integration.